Home / Cloud Computing / YouTube down implies IT is still transforming! For the past few minutes, I have experienced downtime of YouTube. Instinctively, I went to twitter to check if I am the only one or others are experiencing the same issue. To my relief, I was joined by many others in experiencing the same blank screen as on my computer. However, unlike many others who are upset on Youtube for disrupting their entertainment and for some this may even impact advertising based revenue, I wasn’t very upset – instead, this got me thinking even Google’s IT which is the world’s most advanced can have such a setback. 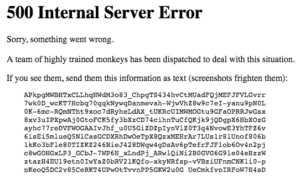 We have seen downtime with pretty much all cloud providers but YouTube going down is certainly significant and implies that IT is still transforming and cannot be 100% fail-proof. Whatever the reason, it is clear that IT still has ways to go to ensure 100% uptime. Other service providers shouldn’t declare ‘higher site reliability than Google/YouTube’ due to this incident as this can happen to anyone if it can happen to Google. We need to keep evolving site reliability for both reducing the financial impact and keeping customers happy – in this case YouTube audience, creators and advertisers happy. As we plan to digitally transform, our IT software and hardware systems and processes will need to continuously evolve! And I am sure YouTube will be restored shortly!